This Sunday, I went with my extended family (about 20 folks other than me, a wide range of ages) to a temple about 80 kilometers from home. 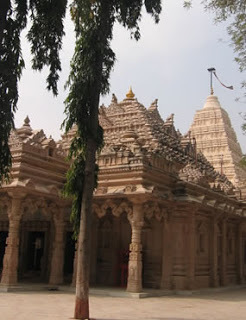 The temple is many, many years old and is one of the most famous Jain temples in South India. We reached in a little under two hours. There were lots of people there. When we got there we realized that the day happened to be a full moon and lot of people believe that a full moon is very auspicious and to top it all it was a Sunday, so convenience got added to the mix! The result - hundreds of people thronged the temple. With a lot of begging and pleading we got allotted two rooms to bathe and change. Before you can do the pooja, you are supposed to bathe and change into clean clothes. I decided to skip the pooja because the crowd in the temple was huge. For me, temples don't work when they are crowded. They work best when I am all alone. So, I picked a corner and just sat there while my family all joined the crowd and completed the pooja. There was a long queue at the garba-griha. All this took about three hours. As we were leaving, I noticed that the crowd was thinning. I thought - how about coming back after lunch? It would be much more peaceful then. We all made our way to the lunch hall and ate. After this I hurried back to our room, washed up and wore the pooja clothes and went to the temple. To my delight, there were hardly 8-10 people in the entire temple and not a single person in the garba-griha! I went in and did the pooja in complete peace and then got out into the rang-mandap, sat right in front of the centuries-old idol of Lord Mahavir to do the chaityavandan - a small ritual. As I started, however, to my utter horror, I heard a lady start screeching on the microphone. She started chanting the verses of the snatra pooja. I was devastated. What could have been a few minutes of complete peace spent in single-minded devotion were now thoroughly compromised! I really wanted to go to her and say, "There are hardly half a dozen people in the entire temple. Why, in the name of God, would you want to use a microphone?!" I refrained. I tried to focus. My ears seemed to be more powerful than my mind. With every succeeding line the lady got louder and shriller. She probably thought she was sounding pleasant. She probably also forgot that when you use a microphone, you don't need to to scream. The device amplifies your voice. That is the bloody purpose of the microphone, isn't it? For a minute, in between, she stopped for a part of the ritual. The silence was heavenly. I got in a few lines of my favorite stavan. It was not long before she began again, shattering the calm with her merciless screeching. Why have microphones in temples? Temples, for me, are a place where you spend some moments of solitude, in quiet introspection and devotion. Microphones serve no purpose but to impose your devotion on others including those who have no interest in it whatsoever. To be honest, they only serve to irritate others who would definitely criticize you and your religion for disturbing their peace at weird hours of the day and night. To me, microphones in places of worship do more harm than good! Modernization is fine. But thoughtless modernization which ruin the basic concepts of the religion and also add inconvenience to others including more importantly, people who have nothing to do with the religion cannot be justified in the name of religion. Can someone, please ban microphones in places of worship??? Some one should put in a note in the Suggestion Box of the temple, or write a note to the Temple Management. I am sure they will respond positively to a polite and reasonable suggestion. Well, this phenomenon is more widespread than this one temple. All temples have this and not sure if writing to the management of one temple would change this. They would say others are doing this, so why not us!